The 31-year-old teacher indicted on charges of child abuse and endangering the welfare of a child after cellphone video surfaced showing her manhandling a child at Hoboken Apple Montessori School in New Jersey says she doesn't deserve to go to jail. Kelli Dugan spoke to NBC 4 New York outside court Monday after she was offered a plea deal in which she would receive probation with 180 days in county jail in exchange for pleading guilty to endangering the welfare of a child. The child abuse count against her would be dropped. Dugan and her lawyer have time to consider the offer. She is due back in court Nov. 30. On Monday, though, Dugan said she shouldn't have to spend any time behind bars. "I had to bring the girl inside the school because she was spitting and throwing a tantrum," Dugan said. "Inside the school, there's a video that shows me taking a paper towel to wipe her mouth and putting back on her shoes because she had kicked them off. There were two other people inside the classroom; I did not hurt the child." She says she's usually "great with kids." Pei-Sze Cheng has an exclusive interview with the day care teacher charged with abusing a toddler. 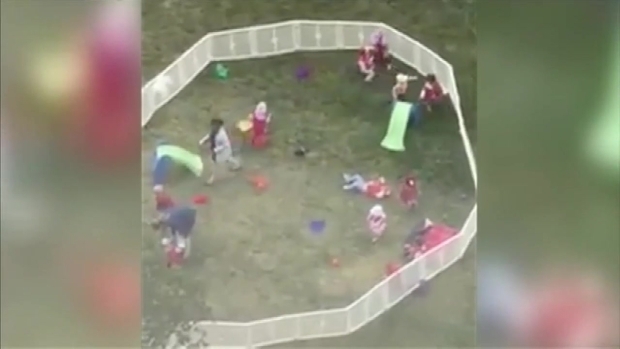 The clip of Dugan obtained by NBC 4 New York in May shows her in red, sitting and holding a 2-year-old girl by her legs, preventing her from moving freely. The teacher is heard cursing in the video; she yells at the child and eventually swings her over a fence before dragging her back inside. Dugan was among the five teachers, aides and officials fired from the school after several videos, including the one featuring Dugan, emerged showing workers inappropriately handling children. A grand jury opted to indict Dugan, but cleared another one of the employees in the videos. As she headed into an initial court appearance last month, a tearful Dugan exclusively told NBC 4 New York she doesn't really remember that day but said it was probably just a bad day. She said she has seen the video and understands why people would get "the wrong idea" but insists she loves the kids she worked with at Hoboken Apple Montessori School and misses them greatly. She said she probably could have handled the situation better than she did. Dugan's attorney, Anthony Carbone, has said the prosecutor is making an example of his client. He says the allegations against her do not rise to the level of the charges in the indictment. Dugan has pleaded not guilty. After the videos emerged, Apple Montessori, which runs 17 schools in New Jersey, said it implemented a comprehensive five-point plan to reinforce staff training, enhance security, and strengthen protocols for child safety and security. "Because this matter is part of litigation, the school is placed in an awkward position regarding what can be shared through the media – even when challenging inaccurate and exaggerated claims," Apple Montessori said in a statement after Dugan's initial hearing last month. "However, it is important to emphasize that the school’s ownership took immediate and definitive action when learning of the incident – including the immediate termination of the employee involved." "The behavior depicted in a related video clearly is inconsistent with the school’s reputation for high-quality education, which has been maintained by more than 2,000 teachers and staff who have cared for students during the school’s 42-year history," the statement said. Meanwhile, the parents of the two children have filed a lawsuit seeking unspecified damages from Apple Montessori Schools and several employees for negligence, emotional damage, breach of contract, assault and other charges.